1. How can you put 5000 books on 2 CD-ROMs? 2. Can the books be read on my PDA or Ebook? 4. Can I print out the books? 5. How do I turn the Books To MP3? 6a. What are the System Requirements for TextAloudMP3? 11. Only known Etext Reader bugs. How can you put 5000 books on 2 CD-ROMs? --- All the 5000 books are in ASCII Plain Text format (.txt) just like most emails. They have no formatting and there for can compressed very tightly. All the books on the CDs are also compressed into ZIP (.zip) files to make them even smaller. The CD-roms include programs to view and unzip them. We even include the program Etext Reader1.2 which does both at the same time and also lets you change the FONT type , and size as well as the background color to make it easier on your eyes. It lets you search the list of books by Title and/or Author. And when you finish reading for the day you can bookmark where you left off. What's really special is that it does all this with out saving the books on your hard drive. It reads the books directly from the CD-ROM s. Just pop the CDs in and go straight to the books and READ. Can the books be read on my PDA or Ebook? --- Most likely. Since all the books are .txt ASCII files virtually all devices can understand the files. Usually your PDA will come with a program that allows you to import text files like emails or .txt files from your computer. Text files are as basic a file as can be and most devices will recognize it easily. Read the instructions that came with your device. If it can import text files or files from Notepad, Write, Word or any word processor it can read text files. ---BookBot is our email book delivery service for travelers or just anyone that wants to read there books away from their home computer. BookBot is basically and email service in which you email us the filename of the book and we email you the book where ever you are. This service is FREE for a year when you buy the collection (just $19.95). Can I print out the books? --- Yes, the books are Public Domain and can be copied and printed according to the Project Gutenberg License included in every book. If you are a teacher feel free to make copies for your students on paper or disks. If you are interested in including them in publications with the proper attributions feel free to do so but please read the Project Gutenberg License. The brainfly.idx and the various indexing files included on the CD-ROMs are the property of Brainfly, inc. and cannot be copied without express written permission. How do I turn the Books To MP3? The way the program works is that you can either listen to text (your book or any text) or you can set it to silently convert your book to an MP3 file. It take my computer about 20 minutes to convert a large book. Just set it and forget it. The program will convert the book to either .wav or .mp3 and save it to your harddrive. Then you have two options. 1. If you converted the book to .wav most disk burning programs that come with your cd burner can turn that file to a regular CD you can listen to on a regular CD player. 2. If you convert the book to .mp3 you can burn it to a CD and play it on any devic: computer, portable mp3 player or a CD player that can play MP3s. It will see the book as just a long song. What do the Books Sound Like in MP3? NOTE: Our primary product is the set of 5000 books in text format on CDROM. The text-to-speech program TextAloudMP3 is a third party application. We don't make it or sell it. We include it as a Cool BONUS for buying the 5000 Books Set. Minimum system requirements are a 300 Mhz Processor w/ 128mb RAM and 500MB Free Disk Space (16khz versions require 1GB Free Disk Space). While on all systems the Natural Voices™ work great when reading to MP3 and WAV files, on systems with less than 256MB Natural Voices™ can have pauses when reading aloud relating to loading voices into memory. Recommended system requirements are a 500Mhz Processor w/ 256 mb RAM and 1GB Free Disk Space. 1. Insert the disk labeled "Classics Edition Volume 1"
2. Use mycomputer or windows explorer to view the contents of the CD rom. 3. Open the Directory "EText Reader Setup and Source". Then Double click "etr-1.2.2-1.exe" or run it from a command line. 4. Once installed run "C:\Program Files\EText_Reader\etr.exe" by double clicking the file etr.exe. This is the default install location you may have installed it somewhere else. You can also double click the ETR icon on the desktop, or launch Programs>Etext Reader >etext reader from the START menu . 6. Choose the file "Brainfly.idx" and press OPEN. This file is on both CDs so you can browse from either Disk 1 or Disk 2.
author by clicking the FIND button at the bottom of the LIST SCREEN. and make multiple BOOKMARKS marking where your left off reading. You can also Browse the titles using your internet browser by opening the files "start.htm". If you have installed an UnZIPPing program like WINZIP.EXE you should be able to just click the link and the browser will launch WinZIP (or any other Unzipping Program installed) and you can VIEW the Book from there. Or you can then unzip the book and read in a regular Text reader like WORD or WordPad.exe. NOTE: IF you don't have WINZIP or some other UnZipping Program installed we have included a FREE Unzipping Program called ENZIP on DISK 2 directory ./Enzip. Have fun designing the look of your book. To start reading your book scroll down past the Gutenberg info. Follow these instructions to install EtextReader (Recommended) or use "start.htm". and click on the "Install EText Reader..." button. The source is in etr-1.2.2-1.src.rpm and etr-1.2.2.tar.gz. 1. 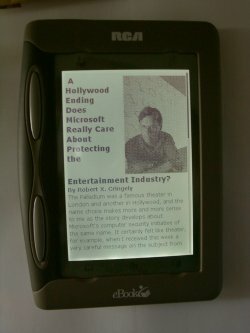 Etext Reader 1.2 does not work with Apple computers but there are other ways to view the texts. 2. Use the "start.htm" file as your index file to look up the name and location of the files. If your internet browser (Netscape, Internet Explorer, etc.) is set up to unzip files automatically all you have to do is click on the link and your browser will open the file automatically. 3. If not you will have to unzip the file manually with your unzipping program (Stuffit). 4. The uncompressed Books are usually too large for the simple editor provided with your Mac. You can use Microsoft's Word, any internet browser (Netscape, IE, etc. ), or any wordprocessor program you have that can handle files from 500k to 4meg. 5. If you don't have a program that can read the larger books we have included two programs on DISK 1. For MacOS 9.1 and lower use SimpleEdit 3.5.1(this one is Free) or Tex-Edit-Plus4.1.2 (this one is shareware). For MacOS X Tex-Edit-Plus-X(shareware) . With these programs you can change the fonts to make them easier to read and even edit them to mark where you left off. 1. Find the file name of the book you want to read by opening the file start.htm in your browser. For example if you are looking for the book "Emma by Jane Austen" click "Browse by Title" then click letter "E" at the top of the page. The browser will then load the page for all the titles starting with E. Go down to the line that says "Emma , by Jane Austen......... etext94/emma10.zip ..... Disk 1" Or search for the line with your browser's FIND function (it's usually under EDIT)The directory in this case is etext94 and the filename is emma10.zip. Volume 1(Disk 1) has all the directories from etext90 to etext00. Volume2 has etext01 to etext04. So etext94/emma10.zip is in Volume 1. Change to the appropriate CD. If your browser is set up to unzip files automatically then clicking "Emma , by Jane Austen......... etext94/emma10.zip ..... Disk 1" will launch your unzip program and then from there you can either view the file or copy and paste it to a wordprocessor or unzip it for later viewing. 2.If your browser is not set up to unzip automatically you'll have to unzip it. If you already have an unzipping program like STUFFIT installed you have two options. b. You may also be able to click on the file name directly and automatically unzip it this way. Simply browse through the CDROM vol1 like you would your harddrive and when you get to the file emma10.zip, open it. This may launch your unzip program and take you through the steps of unzipping it. You can then view it as above with your browser or a wordprocessor. 3. If you don't have an unzip program. Install MacZip. The program is in Volume 2 under Mac programs. Once it's installed launch it and go back to step 2.a. I hope this works for you. If you have any questions email me. NEXT open the eBook Librarian program that came with your ebook. Choose TITLE then IMPORT TITLE. (Make sure your eBook is ON and CONNECTED to your computer) Choose to import it directly into your eBook's memory. Or choose the book from your NEW directory and choose "Send To Internal Memory". Then refresh the view of your eBook titles and VOILA! It should show up in your ebook. The book looks best if you open it in the html editor like Netscapes Composer and save it as HTML. Try formating the text so that paragraphs are no more than 38 characters wide. You can also import them in plain text but they wont be neatly formated. 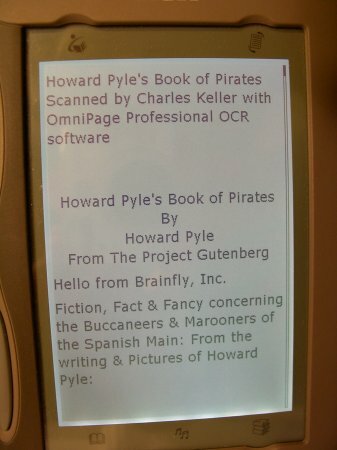 Here are screen shots of Howard Pyle's Pirate Book, and a screen shot of Robert X. Cringely's Weekly Web page which I just downloaded and stuck in my eBook so I could read it later. AS A SIDE NOTE YOU CAN BUY AN EBOOK on eBay.com NOWADAYS FOR ABOUT $125 and you can store about 6 of our books in it. It lasts about 8 to 10 hours of continous use. I can usually read an entire book on one charge. It recharges very quickly. A couple of hours. 1.The Etext Reader program has the problem that sometimes when you start it it disappears and all you can see is the program's bar-icon on your task bar. To bring up the program in this instance RIGHT click the task bar icon and choose MAXIMIZE. It should pop right up. 2.Some times when you open a book in EtextReader it will not display the bottom of a book. If this happens close the window displaying the book. Go back to the index and open the book again.